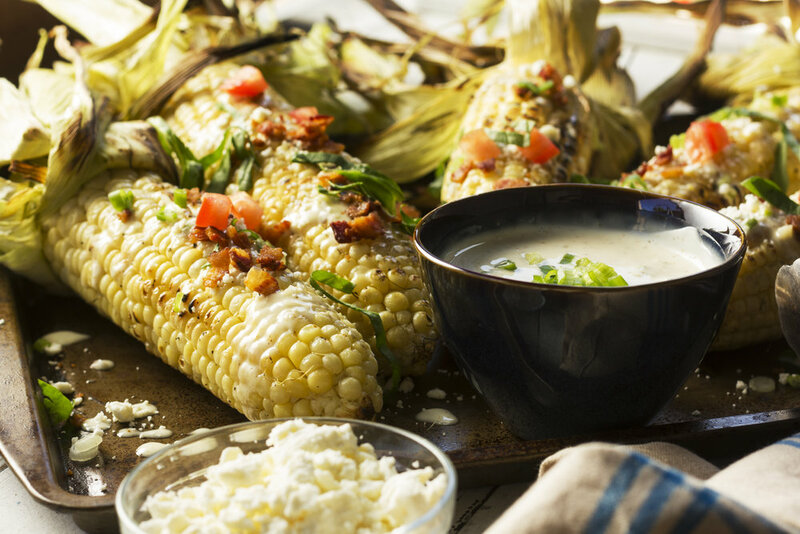 A summer BBQ is a great time to make grilled corn on the cob with a tangy dressing. Pull back the husks on the corn and remove silks. Rub corn with oil and salt and pepper roll husks back over corn and place on grill. Grill corn for 15-20 minutes. Turn frequently until fully cooked on all sides. Pull husks back to grill corn and to add char marks. In a bowl add mayonnaise and rice wine vinegar and whisk together. Add cayenne pepper, garlic, 1 TBLS green onions. Whisk to combine season with black pepper. Squeeze a 1/2 lime and whisk. When corn is fully cooked remove from grill and place on a plate. Spread dressing evenly over corn. Top with feta cheese, green onions, bacon, basil, and tomatoes.